The jaw joint is the most used joint in the human body. It opens and closes over 2,000 times per day in connection with talking, eating, drinking, and snoring. Problems with jaw joints are more common in women than in men, and some have meanly drawn the conclusion that it is due to the livelier conversational tradition of women; however, this is probably not the reason. When the mouth opens, the head of the lower jaw turns in the joint cavity of the jaw joint and then slides forward. The joint has a disk that helps in performing these motions. The disk is easily injured for instance by vigorous biting or direct trauma. The reason behind a functional disorder of the jaw joint may be malocclusion. If the teeth do not contact symmetrically during biting, uneven stress may develop in the jaw joint, and this may cause symptoms over time. One possible explanation for problems of the jaw joint may be nighttime grinding of the teeth. The person doing it may not be aware of it, if he lives alone or if his significant other is too polite to mention it. The symptoms of functional disorder of the jaw joint may be a pain in the place or territory of the jaw joint as well as a cracking or popping sound in the jaw joint. The disorder may also cause headaches and pain in the neck muscles that involve biting and swallowing. 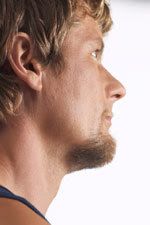 Examination often shows an asymmetrically closing jaw. This can be observed by looking in the mirror and observing the opening and closing of the mouth, following the spaces between the middle front teeth closely. Ideally they should move in a straight line so that they finally end up flush against each other. Pain and additional noise during activity are often perceived in the jaw joint. 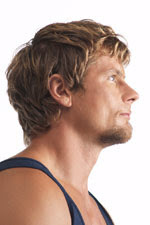 The range of motion for the lower jaw may be limited or asymmetric. An x-ray helps to image the lower jaw bones, and if the disk needs to be seen, an MRI would be suitable. Treatment first concentrates on checking and adjusting bite with the help of a dentist. A soft biteguard as well as muscle relaxants as needed may reduce the tension from nighttime teeth grinding. Anti-inflammatories will reduce the pain and irritation. Physical therapy via massage and heat therapy can relax the muscles involved in biting. This may sometimes be sufficient. Sometimes the jaw joint needs to be trained in order to return it back to normal range of movement. Acupuncture treatments have proven valuable in treating the pain. Sometimes excessive muscle tension is the fundamental problem, and it can be treated by biofeedback and hypnosis. Cortisone shots are an option as well. Surgery is uncommon. The operation of the jaw joint is closely related to the operation of the upper neck. It is therefore advisable to check the functional situation of the upper neck as well as posture and the respective functioning of the jaw joint in cases of neck problems. It is advisable to eat food that does not require forceful biting during the acute phase of pain. If necessary, only mashed foods or foods in liquid form should be eaten. Chewing gum is also not advised, but there are no restrictions for speaking. Some physicians will recommend quality over quantity in speech. Over-the-counter anti-inflammatories can be used as a first-aid self-treatment during a short period to tackle problems of the jaw joint. Cold compresses could be tried at the onset of pain. If that irritates, a hot water bottle or a heating pad may be used to carefully warm the painful area. The muscles around the jaw joint may be carefully massaged. Avoid extreme positioning of the jaw, leaning against the jaw, resting on your back, reading with the jaw forward, and holding the telephone receiver with your jaw against the shoulder. Hold your mouth so that upper and lower teeth do not touch. If there is a tendency of teeth grinding at night, trying to relax for example by taking a warm bath is recommended. A dentist can provide the patient with a plastic biteguard that alleviates teeth grinding and reduces the pressure to the jaw joint. The jaw joint can be exercised while holding the teeth away from each other. On can push the lower jaw forward, pull back and slide it sideways. The mouth should not be opened forcefully, or the teeth should not be pressed forcefully together. The jaw can be dislocated during forceful yawning, vomiting or due to a strike while the mouth is open. If the jaw cannot be set back, a doctor can do it by pressing it downwards. The doctor should cover his thumb during this procedure in case the patient inadvertently bites. Stronger headaches in connection with problems of the jaw joint. Difficulties in opening the mouth. Prolonged joint problems that can’t be cured by home remedies. Jaw joint problems that began after a dentist filled cavities. University of Washington´s article about the anatomy of the temporomandibular joint.